Though acquired as genuine, a dealer in fact concocted this object from old and new parts. 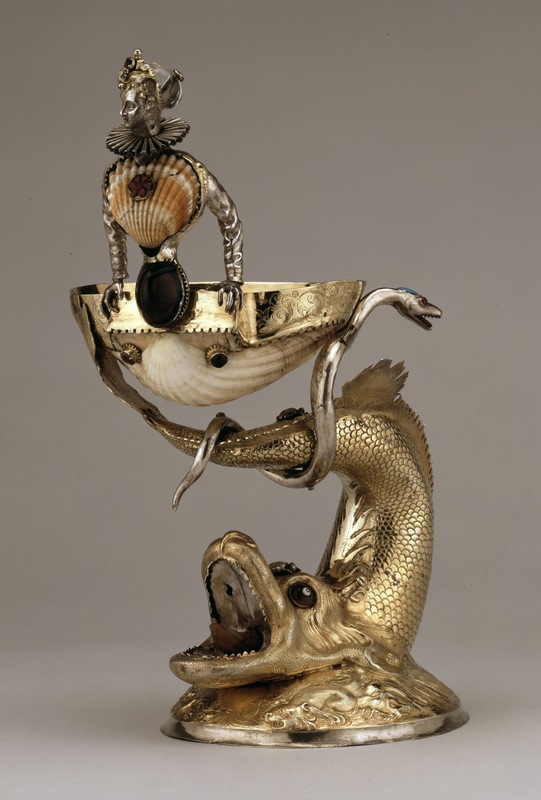 Salt-cellar; silver-gilt; chased; lower part represents whale swimming on surface of water, in which are a number of sea-monsters; mouth open showing tongues of brown agate; scallop shell on tail with border of engraved formal scrolls; from the hinge rises a female figure wearing single ruff, hair dressed and set with garnets, coif of clear crystal with spiral facets, foiled in green; bosom formed of cockle-shell with rosette of garnets; hands rest on edge of shell with cabochon emerald paste between; additional support to bowl from snake set with turquoise and garnet, which is coiled around whale. This object was previously owned by Londesborough and David Falcke, and collected and bequeathed to the British Museum by Ferdinand Anselm Rothschild. Origin: German, perhaps Augsburg; no marks; end of 16th century, with modern additions dating from before 1857. Marks: None, except for a contemporary weight( = 882 g) on the underside of the base. David Falcke, who is said to have “procured it from the collection of a nobleman in Stockholm, where it was considered the work of an Augsburg goldsmith” (Fairholt 1857, pl. XLI); Lady Londesborough, widow of Albert, Lord Londesborough (died in 1860); subsequently acquired by Baron Ferdinand Rothschild at an unrecorded date. Commentary: In Read 1902 the lower part of this salt-cellar was unequivocally described as “a whale swimming on the surface of the water”; in a footnote, reference was made to the lost figure of Jonah depicted in the whale's jaws in Fairholt's 1857 publication, but the significance of ‘the half figure of a lady wearing a wide single ruff’ is not discussed in Read 1902. However, in Dalton 1927 there is neither a mention of the lost figure of Jonah nor of the iconography of this piece of silver plate. In Hayward 1976 the prophet, Jonah, is not mentioned and, indeed, the fish is described for the first time as a dolphin - not a whale; consequently, the earlier serious thematic character of this object was already forgotten by 1976 and so it was possible to describe it as illustrating “the persistence of Mannerist conceits into the 17th century at a time when Baroque taste was dominating the arts” (p. 393). In all three publications the object is not questioned, but is accepted in its entirety as a late Renaissance work of art. In the two earlier publications, it is stated to be “South German, late 16th century”, whereas in Hayward 1976 it is attributed to “South German or Saxon (manner of Elias Geyer), first quarter of 17th century”. However, if the object is recognised as a confection of the first half of the nineteenth century built around the fragmentary remains of a German Renaissance Jonah and the Whale silver-gilt sculpture, the problems of attribution are greatly reduced. On close examination, the exceptionally high quality of the workmanship of the whale and its oval base contrasts dramatically with the feeble, almost crude, execution of the serpent, the rim-mounts of the scallop shell and of the back, arms and head of the demi-figure of the lady. The upper part of this object is technically unrelated to the remainder. Indeed, stylistically the composition of this object in its present form is nonsensical in terms of the repertoire of late Renaissance design. The serpent, in particular, has no meaning or purpose in association with the whale - except as a pathetic device for supporting one side of the scallop shell. Similarly the two tiny toads, attached to the head and tail of the whale, are incongruous additions of the nineteenth-century 'restorer', who clearly had a predilection for cheap stones such as turquoise, onyx and garnet. The present eyes of the whale were almost certainly added at the same time as the upper part of this object was being conflated. Perhaps the least convincing addition to this object is the demi-figure of the lady with its misconceived 'Elizabethan' costume and wholly unacceptable coiffure and head-dress elements. The engraved pattern on the back of the bust is no more convincing than the band of ornament engraved on the rim-mount of the scallop shell; both are weak pastiches of Renaissance models and conflict obtrusively with the artistically chased and engraved decoration on the whale itself and the oval base. It seems likely that the London dealer Mr David Falcke, whose collection was sold at Christie's between 19 April and 11 May 1858, shortly before he retired from business, may have been responsible for 'cobbling' together this Jonah and the Whale sculpture and transforming it into a salt-cellar before selling it to Lord Londesborough. Certainly the reputed former owner - a Swedish nobleman - has not been traced and, not surprisingly, no trace of any comparable object has been discovered. Lord Londesborough had been so convinced about its rarity and importance that he devoted to it a full-page coloured illustration (see Fairholt 1857, pl. XLI) and, after his lordship's death, Fairholt wrote in 1860 that, “the whole is a curious example of the quaint imaginings of the old workmen, and the bizarre tastes of their employers; and was justly valued by Lord Londesborough as one of the most characteristic pieces in his collection”. Fairholt also illustrated it in his 1860 publication of the Londesborough silver plate. If Mr David Falcke was responsible for this ingenious transformation that so completely deceived Lord Londesborough and Fairholt, it would have caused him little expense. The scallop shells - stated by Fairholt in 1860 to be Renaissance curiosities, “the then rare pecten of the South Seas” - were of no value, while the tiny chips of hard-stones were scarcely worth much more, and the silver needed for the serpent, the bust and rim-mounts is so poorly worked that the total cost must have been negligible. The loss of the little figure of Jonah is, however, most regrettable because it may indeed have been contemporary with the whale itself. Although this subject is extremely rare in Renaissance silver-plate, one securely documented example - a Jonas-Trinkhorn - has survived from the Brandenburg Kunstkammer and is now preserved in the Kunstgewerbemuseum, Berlin. This drinking-horn is now thought to be of late medieval origin but transformed into a rich objet d'art at the beginning of the seventeenth century by the addition of an extremely fine sculptural stem, foot and other mounts, possibly by the Master GS or CS, a goldsmith of Straubing. (For the most up-to-date discussion, see Stephan Bursche in ‘Die Brandenburgisch-Preussische Kunstkammer: eine Auswahl aus den alten Beständen’, Berlin 1981, pp. 112-13, no. 39, with illus. and bibl.) The silver figure of Jonah is quite small and, although shown emerging from the jaws of the whale (at the wide end of the drinking horn), is full of expression with arms outstretched, as if trying to maintain his balance. The Londesborough Jonah and the Whale group is, therefore, not without a parallel in German silver, though it remains conjectural if the figure of Jonah would originally have been rendered in the undignified position of emerging backwards on his knees, as shown in Fairholt's illustrations in 1857 and 1860. The form of the whale in the Londesborough Collection example is very similar to the silver-gilt dolphin that supports the nymph riding a sea-centaur by Johannes Lencker (Rijksmuseum, Amsterdam - see ‘Uit de Schatkamer’ 1967, no. 22; Hayward 1976, p. 387, pl. 507). The dolphin's head rests on a circular domed base embossed with marine motifs, and its body and tail rise vertically in a curving, sinuous line to support the upper (and quite separate) figure group. Johannes Lencker's creation can function as a vessel, like the London mermaid ewer and basin of 1610-11 (Hayward 1976, p. 404, pls 677-8), and is dated to the beginning of the seventeenth century in Augsburg -approximately contemporary with this Waddesdon whale. Many of the more bizarre forms of silver vessels have disappeared, but one curious fish-monster ewer has survived since 1612 in the Treasury of the Archbishops of Salzburg and is now among the Medici collection in the Museo degli Argenti, Palazzo Pitti, Florence (see K. Rossacher, ‘Der Schatz des Erzstiftes Salzburg’, Salzburg, 1966, pp. 140-1, no. 54; Kirsten Aschengreen Piacenti, ‘Il Museo degli Argenti’, Florence, 1967, p. 118; Hayward 1976, p. 392, pl. 563). It is important because, although unmarked, it is of high quality and, as John Hayward stresses, bears some direct, or more probably indirect, connection with a Giulio Romano drawing for a ewer in the form of a dolphin, supported on a foot composed of waves. This drawing is preserved in Christchurch, Oxford, and dates from the second quarter of the sixteenth century, but the goldsmith appears to be German, perhaps working in Salzburg c. 1600. Some of this goldsmith's more distinguishing features seem related to the characteristics of the Waddesdon whale and help to confirm the attribution to a south German workshop at the end of the sixteenth century. Hugh Tait, 'Catalogue of the Waddesdon Bequest in the British Museum, II : The Silver Plate', British Museum, London, 1988, no. 40, figs. 209-215.